Popcorn lovers rejoice! The maker of kernels in several wonderful flavors known as Garrett Popcorn is expanding and bringing the beloved popcorn, a Chicago tradition since 1949, to the burbs. The first Chicago suburban location opened just a couple weeks ago in Woodfield Mall in Schaumburg. The shop is offering classic flavors as well as new permanent menu additions at the location. You can also pick up some of the limited time seasonal flavors there as well. Stop in for a fresh batch of the popular Garrett Mix or specialty recipes, like Pecan CaramelCrisp. 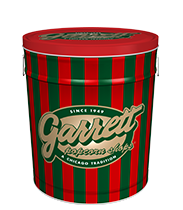 And if you can't make it there before the holidays, keep in mind that you can order the goodies online, too, in tins up to 6.5 gallons at GarrettPopcorn.com. The Schaumburg location joins 10 Chicago locations and two more at O'Hare Airport with additional stores in New York, Las Vegas, Detroit and Atlanta.